Mike Parris gets behind the wheel of a premium edition of the redesigned Ford Expedition for this week's Car Review. WASHINGTON — Large SUVs aren’t what they used to be. While still very large and offering a lot of space, they have been made lighter with smaller, powerful engines that replaced the need for large, fuel-hungry V-8 engines. Power comes from a twin turbo V-6, packing plenty of punch to motivate this big rig. With 400 horsepower when you choose the Platinum trim level, I had no problem keeping up with traffic or hauling people and cargo around. A new 10-speed automatic matches the engine well, offering very smooth gear changes. Fuel economy is improved for the new Expedition. I managed 18 mpg of regular fuel. You can use premium gas for peak performance. I did refill with premium, but didn’t notice much of a difference in performance. The Expedition feels a bit lighter on its feet than before. However, it still handles like a bigger truck with some body lean in turns, so treating it with light hands yields the best ride. The Expedition’s large size can be intimidating at first especially when navigating small spaces. However, it has a very small turning radius when making U-turns for a large SUV. If you’re in the market for a large SUV, you expect a good amount of space. The Expedition delivers with seating for up to eight people. All three rows can handle adults, something not all big SUVs can boast. While the Expedition starts around $52,000, my top-of-the-line Platinum trim level costs about $78,000. The luxury interior comes with soft, perforated leather front seats that are heated and ventilated with Active Motion or massaging. Second row passengers have heated seats and a healthy amount of head and leg room. The third row, once you maneuver yourself in, is very good for an SUV. There’s a heated steering wheel, and controls for the radio, phone and cruise are located on the wheel. Quality wood and leather are used in the interior and soft touch materials throughout the cabin finish the upscale look. The “humble” knob is alive and well and used for the radio and climate controls. There are also many buttons — maybe too many — on the dash and console for drivers used to the touch-screen only systems from other manufacturers. Even the usual shifter has been replaced by a rotary knob that seems to open up some space on the center console. The exterior of the Expedition has that SUV-tough look but with more sophistication than I remember with the earlier model. It’s large with plenty of presence in a parking lot and maybe even more with the Ruby Red paint color. A large truck-like mesh grill adorns the front end styling and it is capped off by a more modern looking LED headlight cluster on either side. With the Expedition Platinum you also notice very large 22-inch wheels and the clean lines without the running boards. Don’t fear. It has running boards. Those running boards are power operated and come down when the door opens. There are a decent amount of chrome trim pieces from front to back on the Platinum version. It works well with the red color. Around back, the design is clean with a high-mounted spoiler on the hands-free operated rear hatch. A splash of chrome and gray colored trim across the hatch breaks up the Expedition’s size a bit. 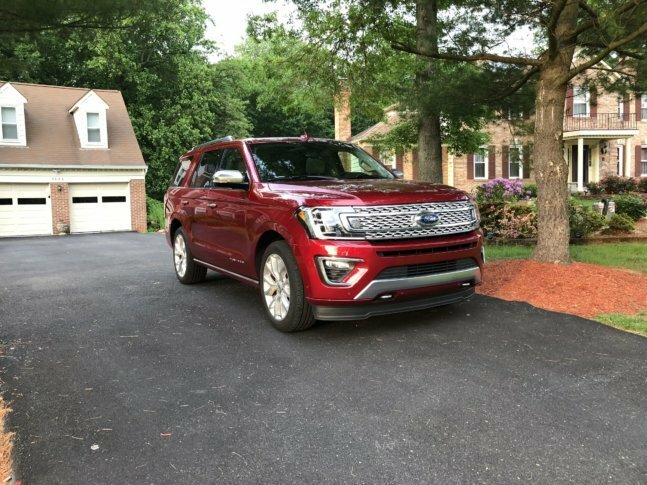 The redesigned Expedition is a serious competitor in the large SUV class again. The new Expedition is more powerful than ever yet gets better miles per gallon thanks to a new transmission, proving more gears are better for smooth sailing and less filling. With size for the family plus a usable third row, this Expedition sports a more luxurious interior, too.